In March 2014 the construction of the Alba B3 platform for operator Marathon E.G. Production Limited (MEGPL) started and was executed at multiple sites across the world. Iv carried out the engineering work at Iv’s head office in Papendrecht as well as in Houston, USA. The 5,800-tonne topside, built at HFG’s Zwijndrecht yard, will compress the gas from the existing Alba field to the processing facilities on Bioko Island. The topside measures 40 x 40 meters and 35 meters in height. 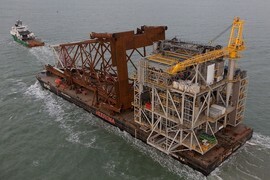 The jacket was constructed in Vlissingen, weighing 2,600 tonnes and with a height of 91 meters. The 33-meter-long bridge to connect the Alba B3 platform to the existing Alba B2 platform, and the 73-meter-tall flare were built by the local subcontractor ECG in Malabo. The barge carrying the Alba B3 topside, jacket and pile sleeves will meet Heerema Marine Contractors’ crane vessel Thialf early next year at its final offshore destination in the Gulf of Guinea. Koos-Jan van Brouwershaven, CEO of Heerema Fabrication Group: “We are proud that after being involved in the FEED study to also have executed the EPCI scope for Alba B3. Working on such a complex scope, executed at many different locations worldwide requires intensive communication and project management skills”. Wim Bal, Managing Director of Iv-Oil & Gas adds: “With our experienced and dedicated project team of Marathon Oil, Iv-Oil & Gas, HFG and other partners involved, we can conclude that we successfully completed the onshore portion of the Alba B3 construction and commissioning. Thanks to all the efforts and hard work of the project team, the Alba platform is on schedule to be installed in the Alba field in 2016”. The Alba B3 compression platform is destined for the Alba gas and condensate field. This is located approximately 32 kilometres offshore from the capital Malabo, located on the island of Bioko in Equatorial Guinea. MEGPL, a wholly owned subsidiary of Marathon Oil Corporation (NYSE:MRO) operates the Alba Field on behalf of itself and working interest partners Samedan of North Africa, LLC a wholly owned subsidiary of Noble Energy, Inc. (NYSE: NBL) and Compania Nacional de Petroleos de Guinea Ecuatorial (GEPetrol).